Although it hasn't received the greatest reviews, one thing's abundantly clear about Eminem's new album Kamikaze — it's wreaking havoc on the white rap community. In addition to his ongoing feud with Machine Gun Kelly, Em is now facing pushback from the Beastie Boys. Ad-Rock and Mike D sat down with George Stroumboulopoulos on The Strombo Show to discuss their forthcoming Beastie Boys Book, but the conversation naturally wound up at Eminem's new album. 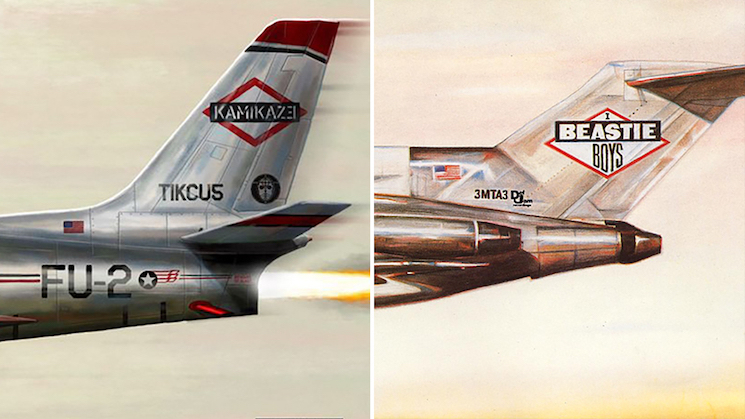 The Kamikaze cover is an obvious homage to the Beastie Boys' License to Ill, but the pair weren't asked for permission to spoof its likeness. "I got maybe 10 text messages, 20 text messages. And I'm like, Why do I all of a sudden have like 50 text messages? I better see what's going on," Mike said. "Everybody's forwarding me the album cover from, like, the Twitter feed, or whatever. So, that's how we found out about it." Thankfully Mike D and Ad-Rock appear to be in good spirits about the thing. After all, we're not sure we can handle any more Eminem diss tracks. Watch the duo appear on Strombo below. They discuss Eminem at the 43:42 mark.